Though I have covered this subject before, with another great season of hunting-related research behind me, and more to be certain about, I must write about this again, this time beginning with the following statements: even if you may think you know everything there is to know about whitetail hunting and choose to ignore anything offered on the subject by anyone else, at least this once, read this. If you're a veteran hunter still searching for something that will improve your hunting success, read this. If you're a beginner, read this. I'll make it short and to the point. If you learn nothing else from this article, learn this: though making trails in the woods is a lot of work, properly done, nothing improves whitetail hunting more … nothing. One of several amazing truths about man-made trails is, you don't have to know a lot about whitetails to reap their benefits. The reason is, whitetails prefer to use relatively clean and quiet trails wherever they go, especially trails coursing through dense screening cover. It's a matter of survival. 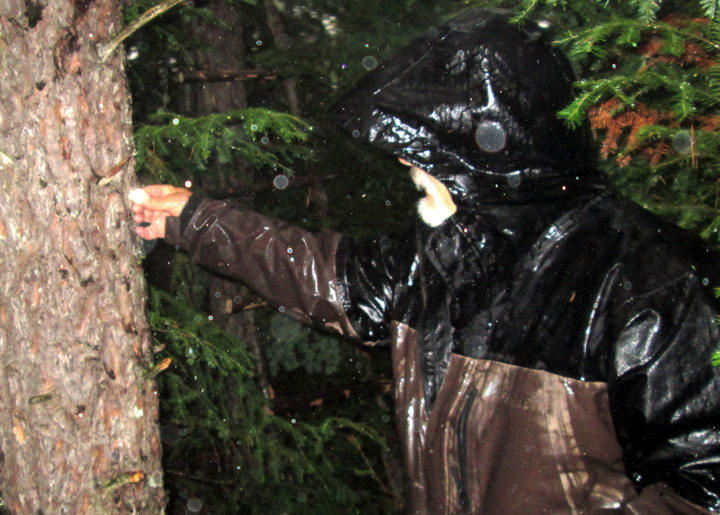 Being inept trailmakers and being severely handicapped when it comes to keeping trails clean and silent, whitetails readily adopt trails properly-made and maintained by man. 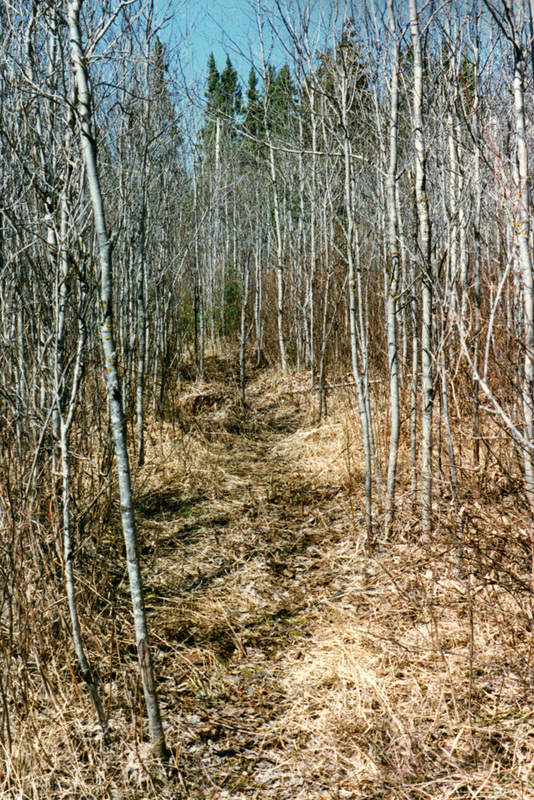 Wherever a trail is properly made in an area inhabited by whitetails, it is sure to be quickly adopted and regularly used by whitetails. For the hunter who yearns to take bucks only, here's another valuable truth: whenever a properly-made trail is cut through a sizable area of very dense cover (cover avoided by human hunters, typically wet or treacherous), the ends connecting with existing deer trails, the biggest bucks (and other deer) living in the surrounding area will quickly adopt it and regularly use it, especially during hunting seasons. Though their movements in very dense cover are hampered by wide antlers, older bucks recognize the superior protection provided by very dense cover. If there's anything big bucks like better than very dense cover, it's an antler-wide trail that gives them easy access deep into very dense cover. 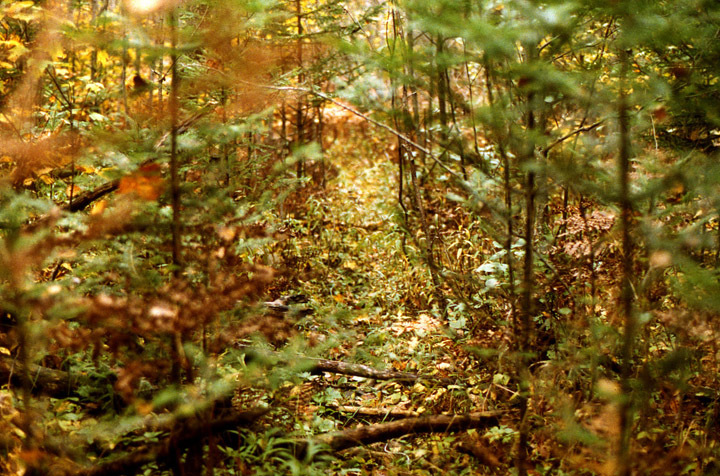 A classic deer trail through dense cover. To be used by hunters, this stretch only needs a small amount of work. The dead branches need to be thrown aside, and a few, dead & live branches need to be pruned. Another related truth to keep in mind is, properly-made trails greatly improve stand hunting success. When properly-used as cruise trails, properly-made trails enable hunters to find trails and sites currently frequented by whitetails on a daily basis without jeopardizing hunting success, thus enabling hunters to keep close to desirable quarries until taken. Moreover, properly-made trails are more productive for stand hunting than any other stand sites, and the odds of seeing deer where two or more properly-made trails converge or cross one another are much greater than anywhere else. Finally, stand sites reached via properly-made trails are far more productive than stand sites without properly-made approach trails, the reason being, human hunters are far less likely to be identified and avoided by whitetails when using properly-made trails. So what is a properly-made trail? It's a trail that makes it very difficult for nearby whitetails to identify a human hunter using it. To accomplish this feat, the trail must be more than a path free of fallen branches likely to snap loudly underfoot. It must be a man-wide, man-tall tunnel through silhouette-screening cover, free from top to bottom of foliage and branches likely to snap or swish when brushed or pushed aside by the moving hunter's clothed body. To avoid easy identification and unwanted use by other hunters, the trail should mapped and memorized, not marked. For the sake of whitetails, hunting, the beauty of our forests and public lands, landowners and foresters, your trail should appear to be just another deer trail. It should be no wider and no taller than a man to discourage use by hunters using motorized vehicles. Wider trails are mistrusted and avoided by older bucks, especially during daylight hours when human hunters are afoot. 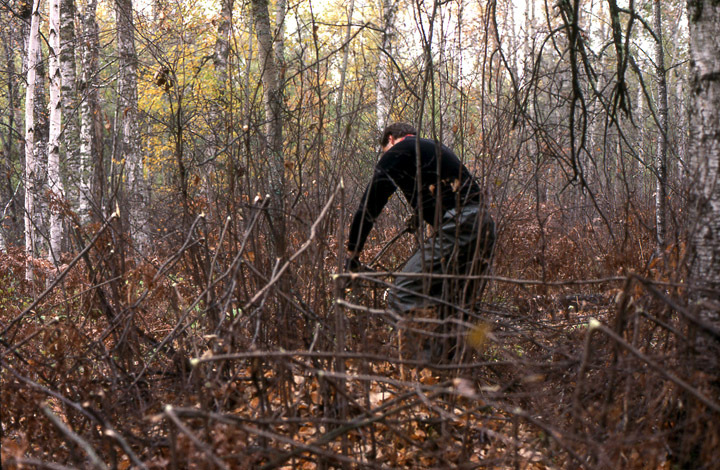 And wherever a trail is needed to approach a desirable stand site without alerted or alarming nearby deer, the hunter should have the option of approaching from at least two directions, insuring an approach from downwind, the only sure way to avoid identification by a whitetail's extraordinarily sensitive nose. This photo demonstrates a classic trail-making mistake. Saplings are being broken at waist-level. For the next few months, these breaks will be bright. This alarms experienced deer. Yes, maybe young deer will use the trail — but don't expect to see any trophy-class bucks. If you need to remove a small sapling from a deer trail, take the extra effort to snip it at its base. A quality trail is best. How do you make such a trail? Never cut roughshod through the woods using a chainsaw. Such a trail will attract more hunters than deer. A chainsaw might come in handy when cutting a man-wide notch through a large windfall, but for the most part miles and miles of wonderfully effective trails can be made and maintained anywhere using nothing more than a $7–13 anvil-type pruner capable of cutting one-inch branches and brush, a light but well-made, $21 belt-toted hatchet, a $7 bow-saw and a pair of $2 work gloves. 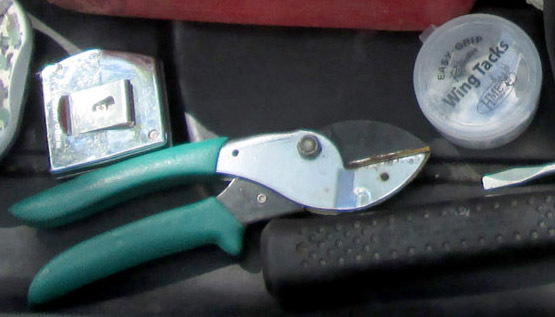 A pruner and fluorescent tacks — 2 keys to trailmaking. Doc inserting a double-sided fluorescent tack. We hardly use traditional blazes anymore — that is, blazes made with a hatchet. In the dark, fluorescent tacks are hard to miss. In daylight, it is hard for hunters not familar with the trail to spot these. We place the tacks high on cruise trails — 4–6 feet. On stand-site approach trails they gradually get lower and lower — dropping from about 3 feet to about 1 foot off the ground. 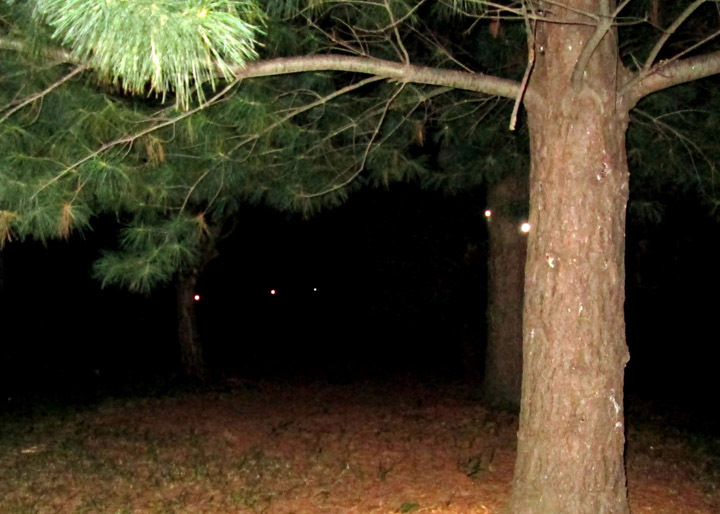 This is a visual reminder to keep our flashlights pointed down when we are approaching a stand site. A cruise trail through second-growth popples we started using shortly after this area was logged 25 years ago. Originally, it was a deer trail. Over the years deer, moose and bear have done most of the work maintaining this trail. We occasionally, throw aside a stick, prune an overhanging branch and prune the thorny plants that grow along it. Where practical, clean up and use existing deer trails, cutting away (at ground level) interposing brush such as hazels, alders and other woody plants that have no value to humans, whitetails or other wildlife. Where deer trails are not found, with the possible exception of young and dense, second-growth aspens, never cut down live trees that are or will become valuable timber. Detour around such trees, young or mature, or, where needed, trim off branches. It is also advisable to avoid beginning a trail where it will be easily spotted by other hunters. I personally make it a rule to begin my trails near some landmark — a tall tree, for example, one easily spotted against a starlit sky before sunrise — 100 yards or so from any road used by hunters driving motorized vehicles. In the 1970's, we learned the hard way. 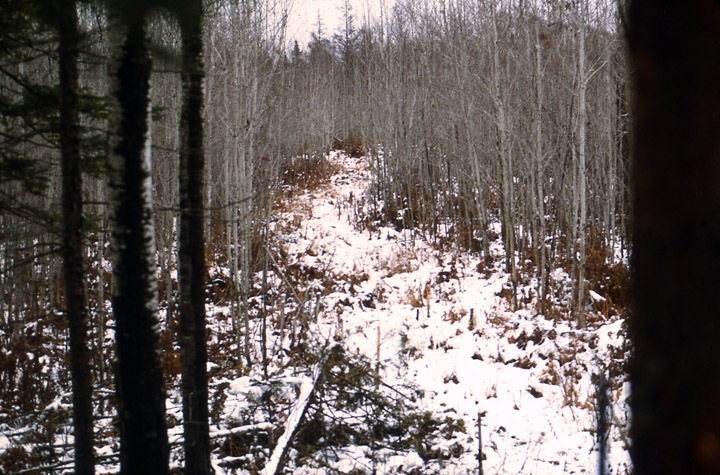 When we made trails too wide — like this one — the big bucks avoided them like the plague — but not other hunters. Trails like this invited unethical hunters on ATVs and even poachers. You don't need to work this hard anyhow. Trophy-class bucks prefer trails the width of their antlers. Gaining the benefits provided by such trails is not simply a matter of hunting them, still-hunting, for example. In fact still-hunting will very quickly destroy the value of such a trail. You must use these trails in special ways. 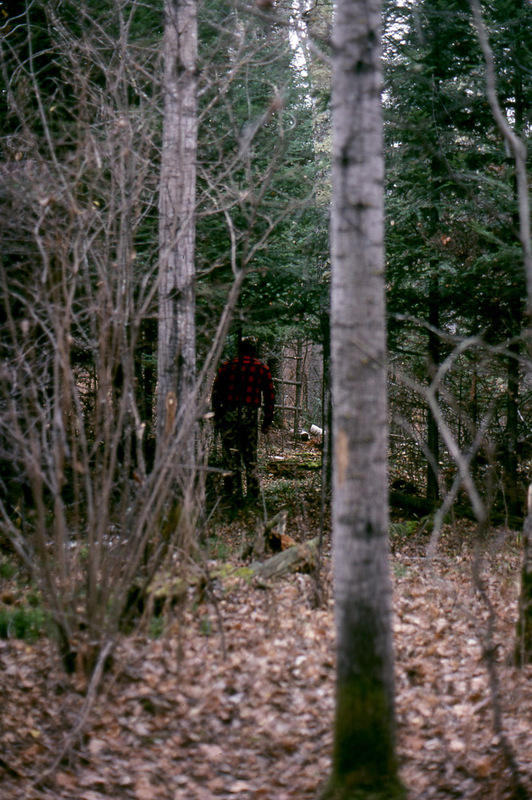 When using one to locate desirable quarries midday during the course of a hunt (mid-hunt cruising) or when using one to get to a stand sites without alerting are alarming nearby deer, you must walk steadily at a moderate pace, never halting, never displaying hunting behavior, keeping your head and eyes on the trail head, thus avoiding stepping on branches and other objects likely to make identifying sounds and evaluating deer signs on the fly. If it is your intention to hunt at selected stand sites along your man-made trails, you must avoid using and depositing fresh, deer-repelling human-scents on the trails upon which you expect to spot approaching deer. In this case you must use other trails to approach stand sites from downwind, never crossing the hunted trail within 200 yards of a stand site. Sure it will be work, but not much more work that preparing a string of tree stands (now becoming obsolete for taking older bucks). Once you're done, it will be relatively easy to keep your trails clean and productive. And once you meet one or more whitetails, especially a big buck, at a site overlooking a spot where two of your properly-made trails cross, you will never think trail-making is “too much work” again.